Moontit D. carnegii holoteep skeleton at the Carnegie Museum of Natural History. 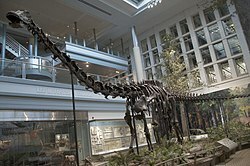 Diplodocus is an extinct genus o diplodocid sauropod dinosaurs whase fossils war first discovered in 1877 bi S. W. Williston. This page wis last eeditit on 23 Mairch 2017, at 19:55.